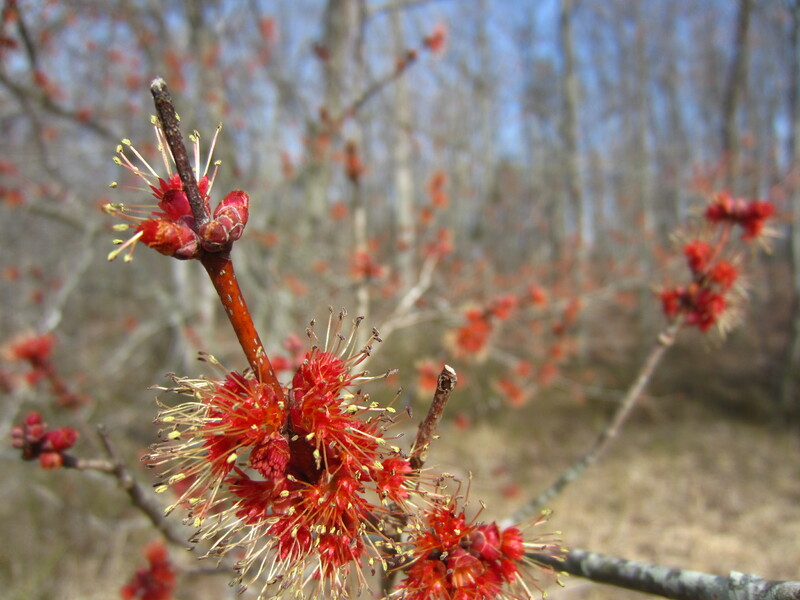 Winter is hanging on tight this year, but we see new signs of spring each day. 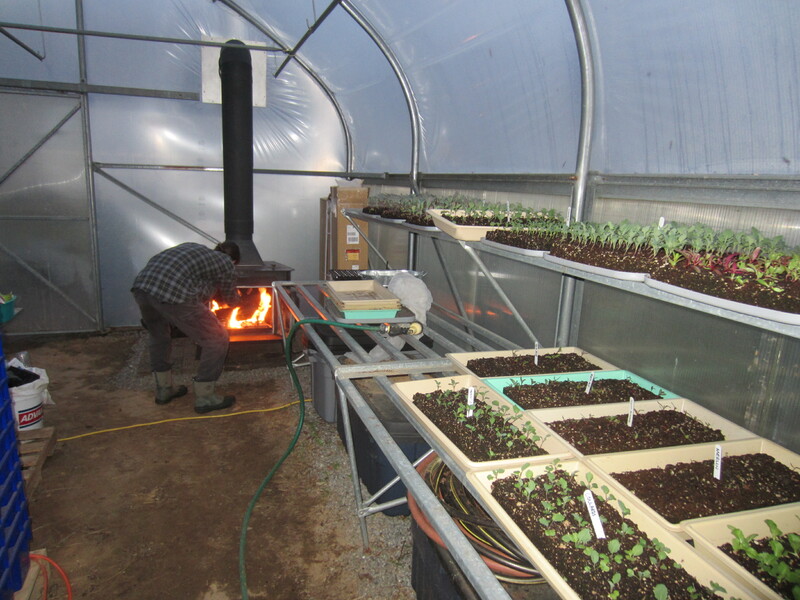 Our potting-house is now officially a greenhouse, with central heat from the wood stove! The stove was generously donated to the farm by my aunt and uncle. 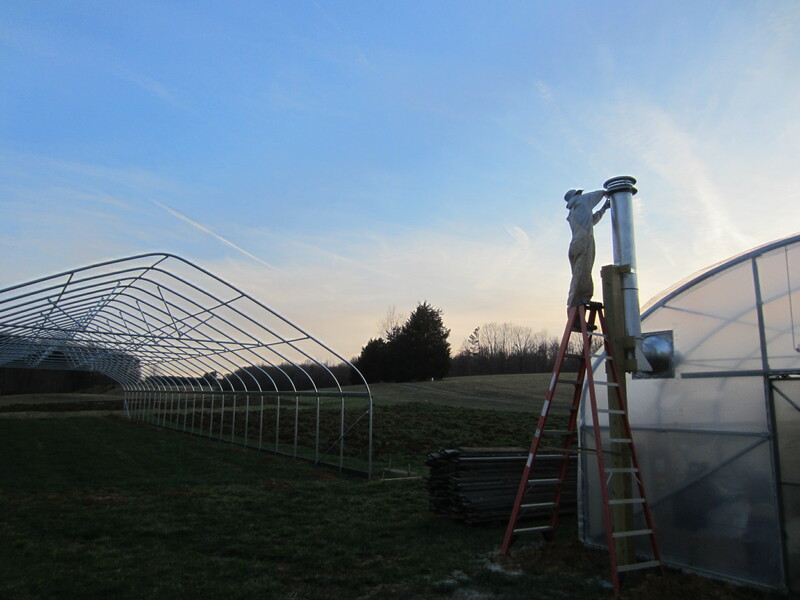 It is keeping our seedlings warm on these 20 degree nights. And what great ambiance for potting seedlings on a drizzly cold day! Time to start ginger again. Our shiitake project is finished. 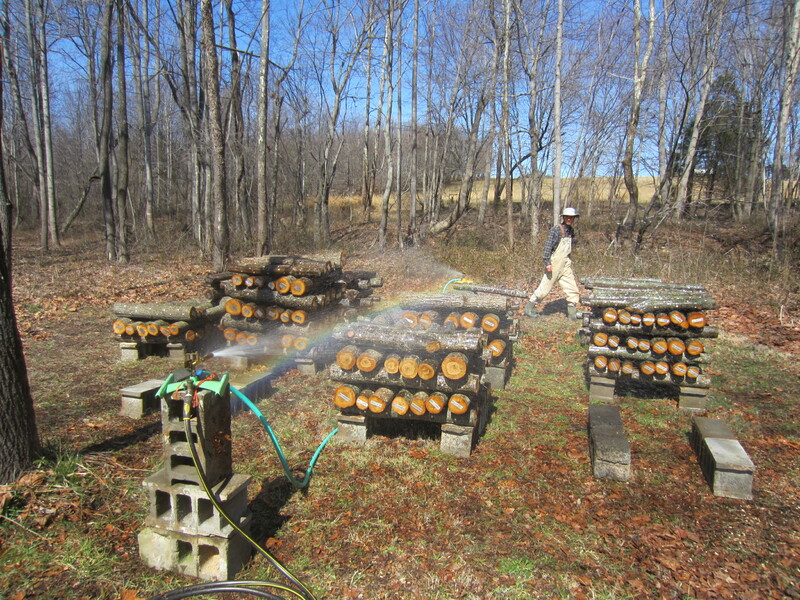 We set up sprinklers for the logs to help keep them at the right moisture content. 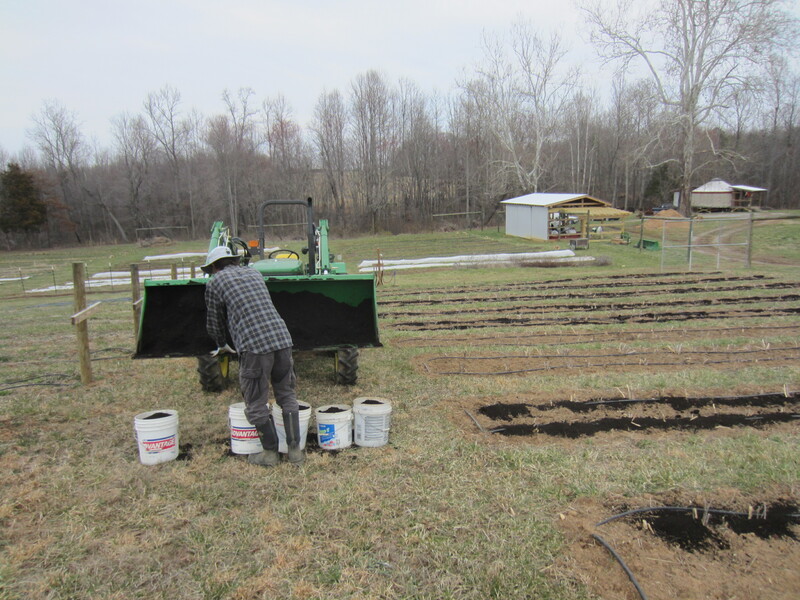 The weather has not been very cooperative in helping us get our spring soil prep done. 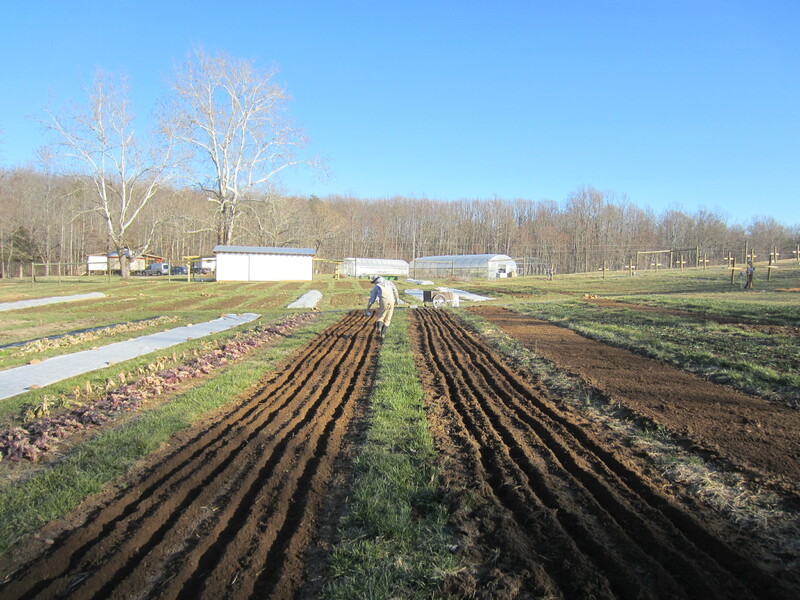 Nevertheless we were able to find a few days when we had decent conditions for tillage, plowing, and composting some areas. We are expanding our production area by quite a bit. 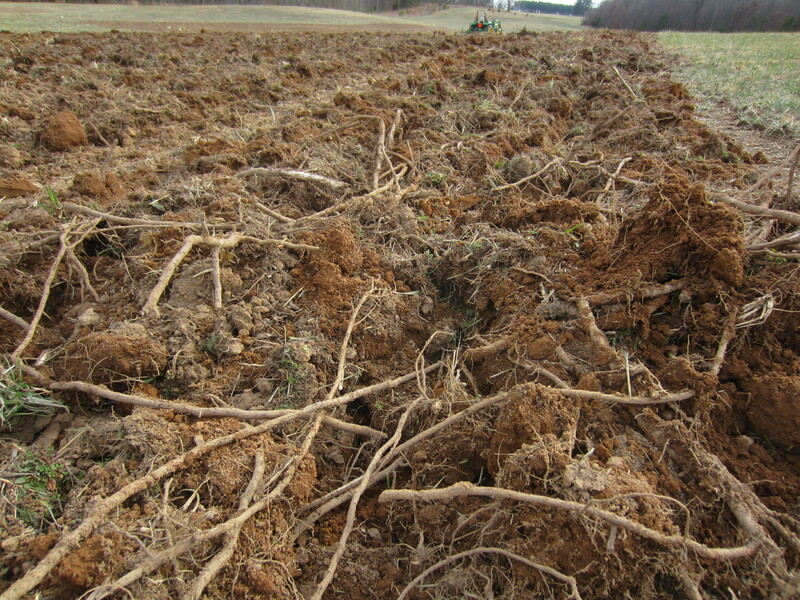 This new field has some serious weed issues so we will only grow cover crops here this year. 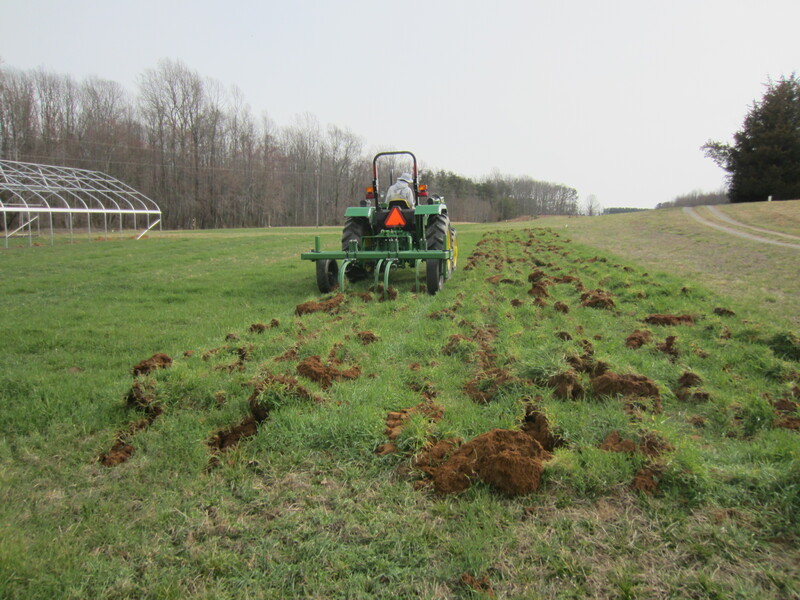 Tilling in cover crops in the field outside the deer fence. 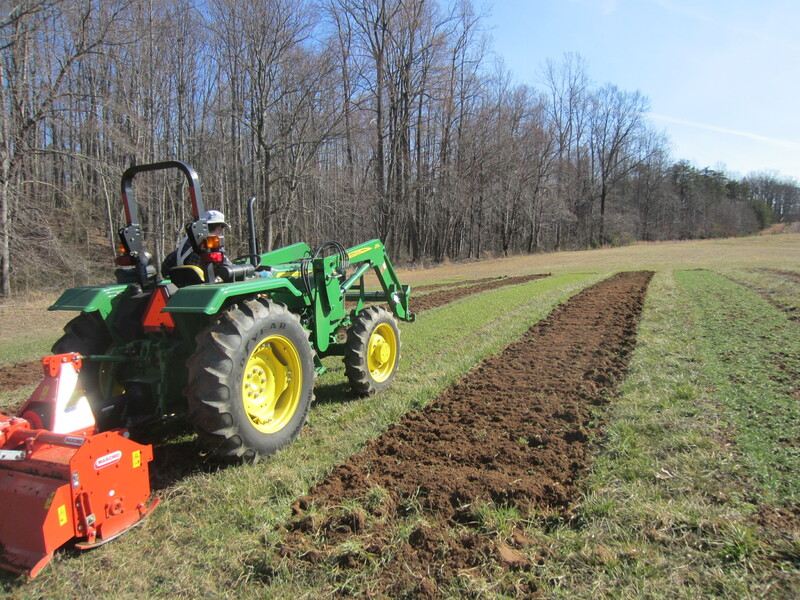 The wheat and clover will take a few weeks to break down before we can plant here. 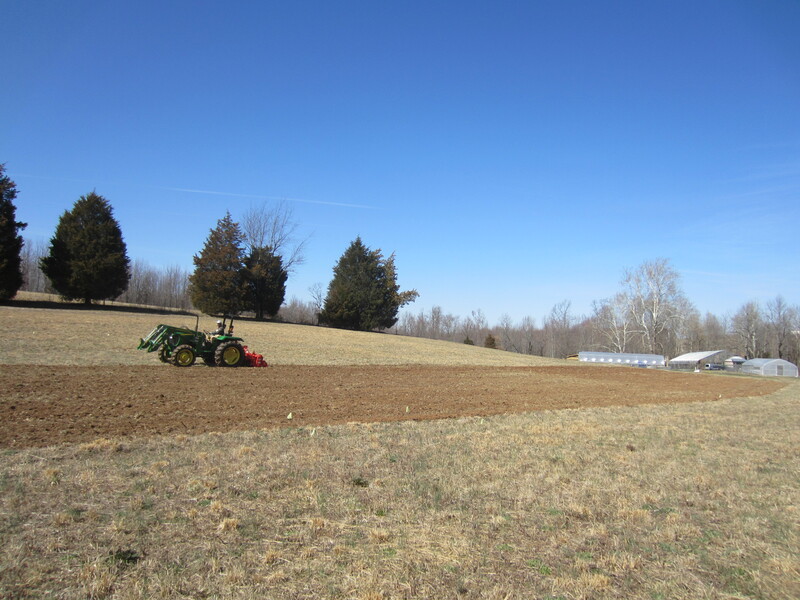 Another new field we’ll be growing in this year. Time for some rock removal. Composting the asparagus patch. I’ve spent quite a lot of time weeding here over the past month. This area of the garden got a heavy dose of compost. 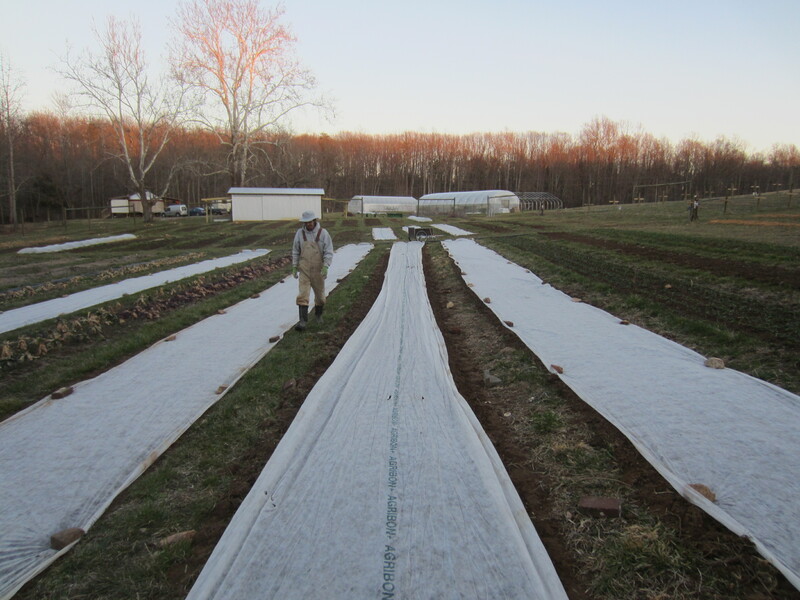 Row cover to help the soil heat up. 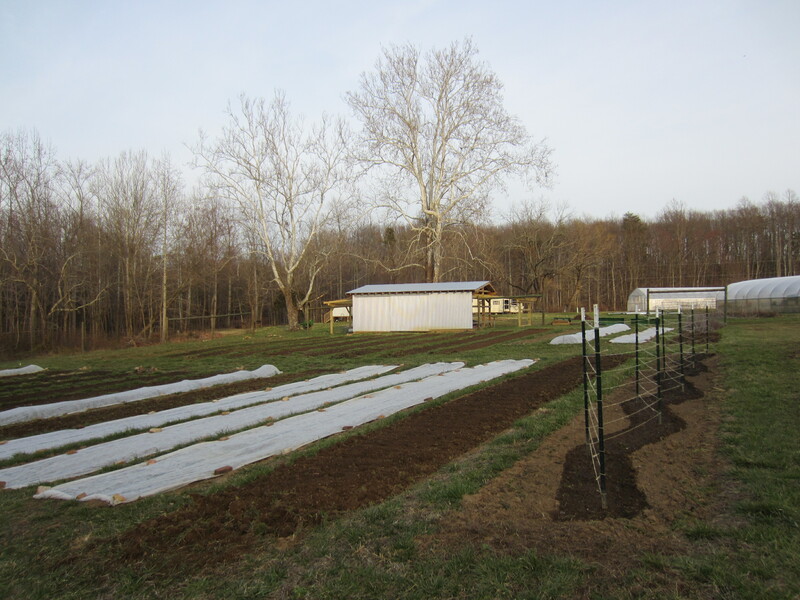 Soon the trees will be covered with leaves and the garden will be full of good stuff! I can’t wait! Hope you have a happy spring wherever you are. And this is your quiet season??? No wonder we don’t see much of you! What are the flowers in the first photo? I’m glad you are planting beets. I had to look at three stores this week to find fresh beets. 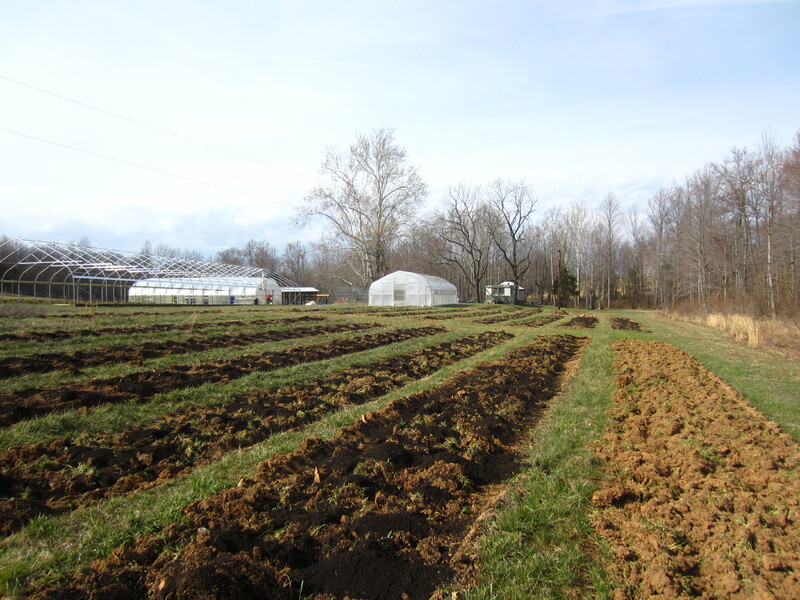 The start of spring is a hopeful time for farmers! I hope your Minnesota spring comes soon. It’s no fun traveling on icy roads! Wish we could hire help but it’s just us doing the work for now. Thanks. 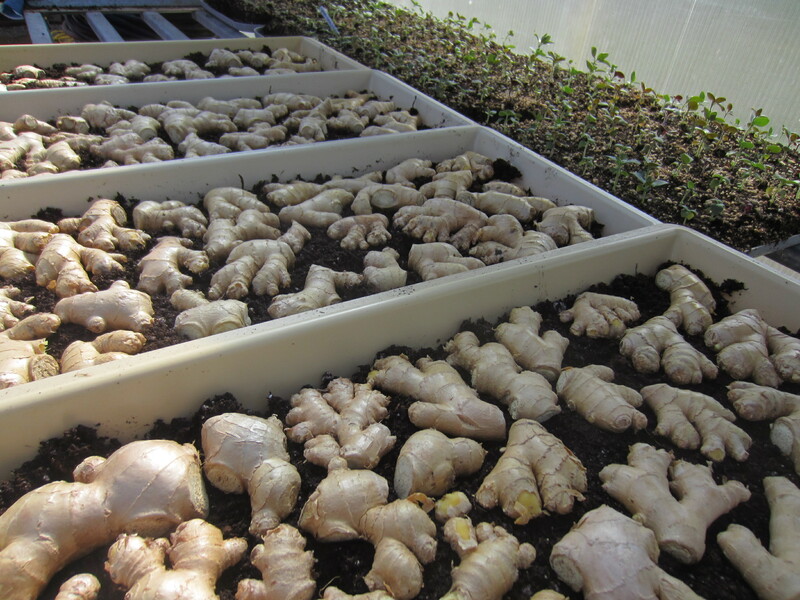 The ginger is a great crop, but requires a very long season so we have to grow it in the tunnel. Then the harvest period is very short for the fresh ginger, but it freezes well, so we can enjoy it year round! I’ll have to check out my gravatar, when I set up all this I had no idea what I was doing! Computers have always been a challenge for me, so I appreciate your advice.